The commemoration of Memorial Day has its roots in upstate NY. In between Seneca and Cayuga Lakes in what is known as the Finger Lakes region sits the quiet little town of Waterloo, NY. Waterloo holds the distinction of conducting the first community event to honor the fallen veterans of the Civil War. 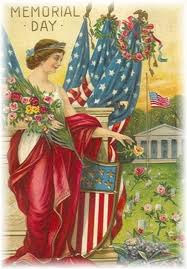 Decoration Day, as it was called in Civil War times, had been celebrated all over the South as women decorated the graves of their glorious dead. These were for the most part independent ceremonies, and varied from town to town, and county to county throughout the south, until the efforts of Henry C. Welles, a druggist who resided in Waterloo, NY unified and dedicated a day of observation. Welles and local war hero General John B. Murray organized a single, cohesive day to honor those who had fallen in defense of the Union. On May 5, 1866, flags flew over the village of Waterloo at half mast. Dressed in black mourning clothes, a procession led by General Murray marched to the town's three cemeteries and decorated the graves of the slain. A band accompanied the march with martial music along the evergreen-festooned avenues. The following year, Waterloo commenced with the same commemoration on May 5. By 1868, other communities organized their own events on May 30, which has been the official day of observance in the North ever since. The South continued to mark their own events and days to honor the Confederate fallen, and it wasn't until WW1 when all soldiers who gave their lives on the battlefield were honored that the south officially observed Memorial Day on May 30. One hundred years after General Murray and Mr. Welles set aside a day in May to honor the men who died in battle, through a series of events, NY Governor Nelson Rockefeller, the United States Congress, and President Johnson himself recognized Waterloo, NY as the origin of Memorial Day. Welcome Nike, and congratulations on your imminent debut with Desert Breeze! I am excited about your Sanctuary Point series on a personal level. My mom grew up downstate New York during WWII, so this series will likely be very nostalgic for me, and a wonderful read for any fan of romance, suspense, and crime fiction. 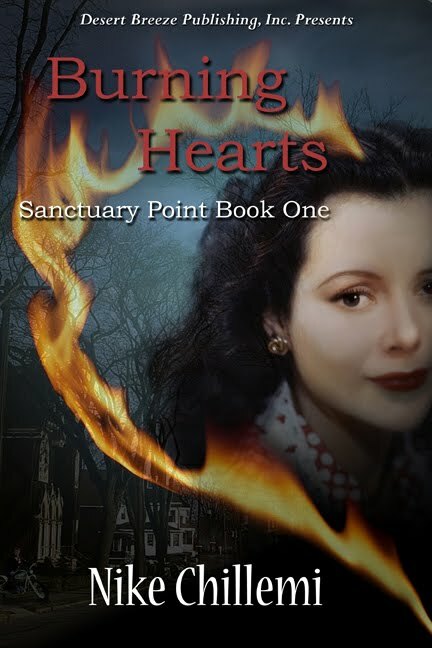 I have a feeling you are going to be the next big thing, and I am excited to have you here to discuss your wonderful book, Burning Hearts, which is set to release May 15. I'm thrilled to be here. I love the 1940s. There's a kind of natural glamour and sophistication to the period. Ordinary women loved to dress up. The men were so debonair. I love the downstate, Long Island area because it's on the Atlantic ocean. I am crazy about the ocean. There's nothing better than sitting under a cabana, watching the surf come in with a good book. Again, thank your for having me. Can a sheltered young seamstress, disillusioned by the horrors of WWII, escape an arsonist/murderer who has killed her employer and mentor, while trying to decide if she can trust the dashing war hero who’s ridden into town on his Harley—who some say is the murderer? Erica Brogna’s parents doted on her and taught her to think for herself. Many boys she grew up with have fallen in the war, shaking her childhood faith. In rides a handsome stranger, at the hour of her most desperate need. A woman who is her best friend and mentor is trapped in a burning house. After making an unsuccessful rescue attempt, Erica stands by as this man rushes into the inferno and carries her friend’s lifeless body out. A few years ago, when I seriously began writing for publication, I was shocked to find some inspirational judges in writing contests found my writing edgy. Erica Brogna, my heroine in Burning Hearts, is rather naive as far as men are concerned. And for that matter, Lorne Kincade, the hero, is awkward around women. They don't even kiss until the final chapter. So, that feedback floored me. I thought, what's edgy about this? When I did get more in-depth criticism, I realized it was because I don't present the darkness of life in a neat package. I don't soften the edges of evil, so I guess my writing is edgy in the classic sense of the word. I think Christian readers are not only ready for realistic writing with plausibility, they're hungry for it. I couldn’t agree more, Nike. The authors who shaped my early writing were general market authors. I couldn't find any Christian writers who wrote the way I wanted to. They were out there, but it took me a while to find them. Michael Connelly, who was the crime beat reporter for the LA Times for twenty-five years and who writes the bestselling Harry Bosch series influenced my writing the most. His knowledge of police and court procedure is vast and the man can write. The movie, the Lincoln Lawyer, recently out, is based on his book. Matthew McConaughey did an outstanding job -- oh, pluck my eyes out. Then of course, I did find Christian writers. James Scott Bell was the first, then Robert Liparulo, J. Mark Bertrand, Steven James, and Sibella Giorello. I guess you could say, I follow in their footsteps. New York City has been on the hearts of many this week recently. With the passing of Reverend David Wilkerson, and of course the death of Osama bin Laden, New York City seems to be in the cross hairs spiritually, politically and emotionally. You’ve been a long time resident downstate, and a passionate Christian. How are the two—New Yorker and Christian—disparate, and how are they inseparable for you? I just Googled, "how many Christian churches in New York City?" The answer was 6501. So, the Christian church is alive and well in Gotham. Any place where you have a population of about 8 million, you're going to find activity of many sorts going on. Also, an urban environment so vast offers anonymity and cover for those engaging in nefarious activity. If you want to do something immoral or illegal what better place to do it than where you aren't known by everyone and can operate largely unseen. I write about villains who choose to behave in this premeditated fashion, but they may live in a small village like Sanctuary Point. David Wilkerson who recently died in a car accident in East Texas founded the Times Square Church. He was the spiritual force behind the renaissance in the formerly degenerate Times Square area. Rudi Guiliani was the political force behind the cleanup. Rev. Wilkserson also founded Teen Challenge. His passing is definitely mourned in the body of Christ. As to Osama bin Laden. Oh, Lord, words fail me. I'm so proud of our Navy Seals who completed such a complicated military operation with such finesse. It seems so obvious to me that the US intelligence community is largely responsible for this terrorist's demise and probably for keeping the homefront safe all these years since the 9/11 attack. I thank our military and CIA, Homeland Security, FBI and all other agencies from the bottom of my heart. How have both influenced your world view? I suppose urban living has influenced my worldview and my writing. Though NYC is so vast, I actually live in a residential area filled with houses that have backyards. Our house is only a short walk to a protected salt marsh that empties into the Atlantic Ocean. I am just as drawn to the ocean as I am to the city. That's why my Sanctuary Point series is set on the Great South Bay of Long Island. Yet its urban neighbor influences my tiny fictitious village. Erica reads a fashion forward women's magazine and makes slacks for herself that she wears around the village. Needless to say, some eyebrows are raised. What do you hope that readers will take away from Burning Hearts and the Sanctuary Point Series? I want to show how ordinary people can rise to great heights in standing for what is right and against evil. I hope my readers can see the "natural nobility" unpretentious people can display when against all odds they do the right thing. I hope my main characters Erica and Lorne come off in this way. As we've talked about in the earlier questions, there is great ugliness in the world. I don't want to deny the ugliness, but want to show there is greater beauty. I hope my readers come away knowing the greatest, most powerful force on earth is love. Give our readers a link or two where they can order your book, and where they can learn more about you and your writing. It can also be obtained through Amazon and Barnes and Noble. Thank you so much, Nike, for sharing your heart and allowing us to celebrate with you on your upcoming debut. I thrilled for you and wishing you every success! Thank you for having me. This was great fun. 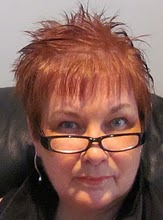 Vickie McDonough is one of those authors who can do it all. She made me laugh, she moved me with sympathy, and she had me totally engrossed in this story of three romances-in-one. Jack is the headstrong daughter of Rachel from the first book in the Boardinghouse Brides series. She falls head over heals for the new preacher in town, except that the new preacher isn't really all that new to town. . . Noah has a secret. He not only used to live in Lookout, Texas, but he was the town's former schoolyard bully. If folks--especially Jack--discover his secret, he will lose everything, including his job and his hopes for love. Rand Kessler is the wealthy bachelor from the first two books who I longed to see hitched, since he was so patient and understanding after being scorned twice. I wouldn't have minded him having a bigger role, but the center stage was rightfully occupied with Jack, Noah and also Garrett and Carly, two other returning characters. Carly struggles to feel accepted after serving time in prison. She longs for a chance at love and family, but the constant glares from townspeople make her dreams look impossible, until Garrett Corbett comes a courtin'. He was the prankster from the first romance, who ordered three mail order brides for his cousin Luke. The trickster has mellowed with age, but retains an endearing cantankerousness that puts him and Carly at opposites. And we all know that opposites attract like north and south magnetic poles. 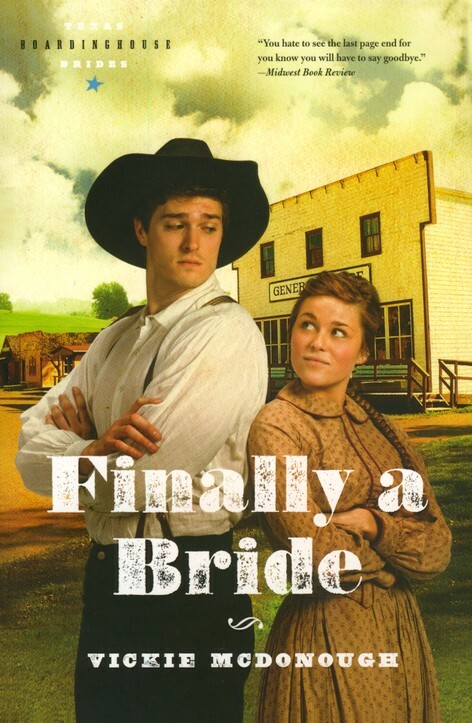 Finally A Bride was the best of the series, in my opinion. Historical romance has a rising star in Vickie McDonough. You won't want to miss this book! 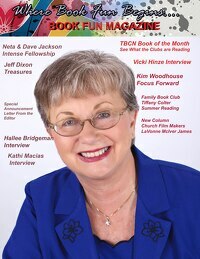 Leave a comment with your email addy and follow this blog for your chance to win a copy. Winner to be announced Friday, May 6.